DHT inhibitors and salon-quality ingredients make the HairCycle Shampoo excellent for hair health and retention. It includes a powerful array of biotin, proteins, and other nutrients. Faster growth, a healthier scalp, and greater thickness are the natural result. Add greater life to your hair with HairCycle Conditioner. This salon-quality treatment applies a light layer of protection to hair that blocks sunlight and other environmental damage. Hair becomes more manageable, thick, and lustrous upon lathering. 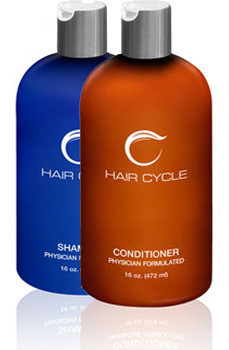 Also a nourisher for your hair and scalp, HairCycle Conditioner features a vast array of proteins and other nutrients. Featuring powerful concentrates, the Post Biotin Spray helps scalps heal faster. Particularly effective for hair transplant procedures, the spray is also effective for accidents or other instances scalp tissue recovery. A groundbreaking and unique formula, Post Biotin Spray offers superior results with 100% safe ingredients. Improve healing times and minimize scarring with the Post Surgical Gel. This treatment speeds the recovery of most tissue wounds but is ideal for hair transplant procedure recovery. An exclusive and highly effective treatment with 100% safe ingredients, this HairCycle addition truly facilitates the best hair transplant result possible.